Enable all data to be protected by password and touch ID, your privacy will not be stolen even you lose the flash drive..
Light weight,as small as lipsticks,keychain hole makes it easy to carry when you on trip. 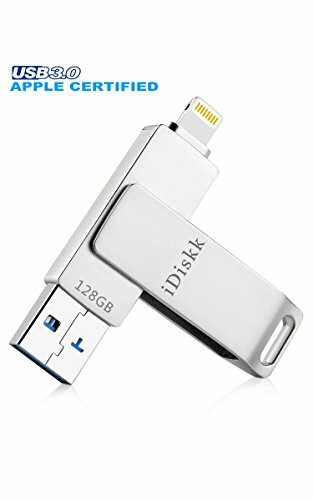 The iDiskk Flash Drive is designed with a 4mm longer connector to connect directly into your iPhone or iPad without having to remove your case. 1. If necessary, please remove your phone case first. 2. You cannot transfer Music and Video files in iTunes or downloaded by the 3rd APP to the flash drive, as they are DRM (Digital Rights Management) protected. 3. You need to install ""iDiskk Pro"" app from App Store before connecting with your Iphone. ✔【FAST FREE UP SPACE WITH 128GB EXTERNAL STOGRAE】-Just connect in the lightning flash drive, easily move photos, videos and other files off your iPhone or iPad and onto the flash drive, from the drive, you can also transfer these files into your Mac,PC or other devices. ✔【AUTOMATIC PHOTO or VEDIO BACKUP】 -Every time you connect the flash drive in, use "iDiskk Pro" App camera to take photos/video ,which will be automatically stored into the flash drive. ✔【HIGH-SPEED TRANSFERS WITH USB 3.0】 -Apple Certified flash drive gurantees fast and stable data transfers,one HD movies ( approx. 1GB) only needs about 20s. View More In Data Storage. If you have any questions about this product by iDiskk, contact us by completing and submitting the form below. If you are looking for a specif part number, please include it with your message.